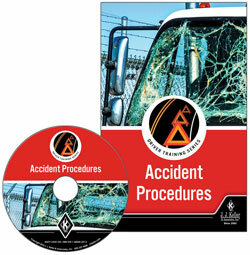 Provides step-by-step procedures for what to do after a crash. Reminds driver that their actions and accurate documentation can prevent damages or injuries. (1) Trainer Guide - Product Code: 45589 (860-H) - Provides information on how to develop, organize, and conduct effective accident procedures training sessions. (10) Driver Skills Cards - Product Code: 45595 (920-VC) - Recaps the key points from the training program and serves as a reference tool for drivers to use either before or after the training session.